Mini Remastered by David Brown Automotive has resurrected the original Mini for the 21st century. The Mini Remastered is a handcrafted masterpiece with updated style, technology and engineering excellence, whilst retaining all the spirit and personality of the original. The original Mini body has been de-seamed, strengthened and sound-proofed throughout. Sculpted body-coloured wheel arch extensions and centrally-mounted exhaust outlets provide the car with a classic, yet dynamic stance. Modern LED rear light clusters and indicators in aluminium surrounds replace the original plastic lights. A new aluminium grille and chrome bullet-style door-mounted wing mirrors with integrated LEDs further add to the modern treatment. The 1275cc engine has been completely rebuilt from the ground up and produces 78bhp and 91 lb-ft of torque, making it good for a claimed 0-62mph time of 11.7 secs and a top speed of 90mph. To compliment the reconditioned engine, the gearbox, suspension and brakes have been upgraded to improve reliability and make sure the car handles the way it should. Inside, equipment like a premium infotainment system operated via a 7″ touchscreen interface, offering Bluetooth® connectivity alongside Apple CarPlay® and Android Auto®. is standard. Also included is USB charging, a starter button and remote central locking. The dashboard is hand-trimmed in leather from British-sourced cattle. Other retro touches like Smiths dials, knurled aluminium switchgear and an engraved Moto-Lita steering wheel complete the look. To top it all off, there’s even a cupholder! 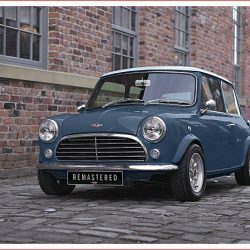 Each Mini Remastered by David Brown Automotive will be hand-built individually to order, with each Mini Remastered model taking around 1000 man hours to build from start to finish. Along with what’s called standard trim, there will also be two special editions, limited to 25 Minis only, available: ‘Inspired by Café Racers’ and ‘Inspired by Monte Carlo’. The former is finished in cream with a chocolate brown roof, with cream seating and chocolate brown leather on the dashboard, while the latter is metallic red with white racing stripes, foglights and black wheels. Click Here to visit the David Brown Automotive website to learn more about the Mini Remastered. What do you think ? Has DBA captured the classic Mini and given it a worthwhile update ? We’d love to hear your comments.